Sugar Gamers - New Game Bundle Release - featuring a story written by Keisha Howard! Announcing a major Sugar Gamers collaboration release that you can get right now – featuring the first published work of fiction written by our intrepid founder and leader, Keisha Howard! Specifically, this release focuses on hip hop, cyberpunk, and tabletop roleplaying games (click here to go right to the bundle). Member of the Sugar Gamers and resident mad scientist, Colin Kyle Kickstarted a tabletop RPG last year he co-created with his brother Cameron (together they form Wrong Brothers Gaming). The game, called Axon Punk: Overdrive, combines classic cyberpunk with hip hop to project into the future megacities of 2085. 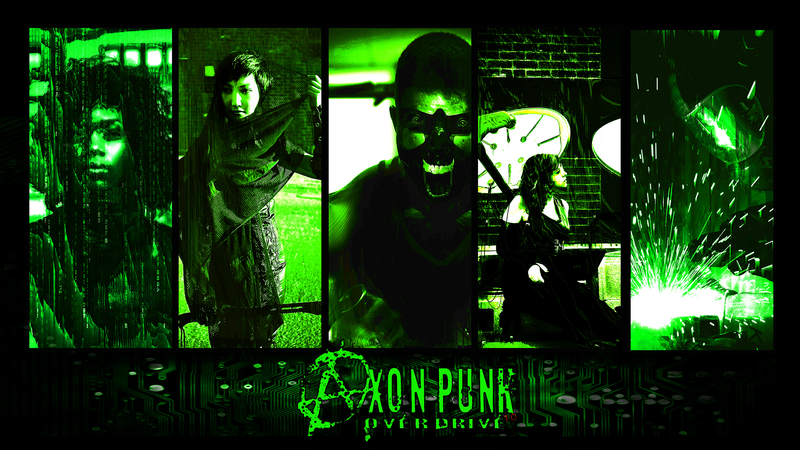 There are TONS of cyberpunk games being released these days but hear us out, Axon Punk is genuinely bringing something new and unique to this beloved and controversial genre. A benefit and limitation of cyberpunk is that it has a strong aesthetic and relatively well established vision of the future. This current vision, as awesome as it can be, is defined in most movies and games by the white male, able-bodied gaze. We knew this before we started working on Axon Punk and wanted to make sure from day one that everyone can express their vision of the cyber future through the game. Cyberpunk is about marginalize people living in a dystopian world full of invasive technology – sounds like something today’s minorities, LGBTQ+ people, immigrants, and people of color can identify with! To make sure our cyberpunk future will resonate with our audience, Colin and Cameron began working with the Sugar Gamers before Colin was an official member of the Sugar Gamers. Keisha and the Sugar Gamers helped playtest and develop the hip hop inspired world of Axon Punk. To further involve the voices of women, queer people, people of color, and non-able bodied people in the game, the Wrong Brothers commissioned a collection of original mini-fiction stories set in the world of Axon Punk to be written primarily by members of these communities. For most of the eight authors that contributed to the collection, called The Gonzo Documents, this was their first official publication and we are thrilled to introduce the world to their work. Among this all-star lineup of authors from the gaming community, we have the pleasure of including the first official published story written by Keisha Howard, the founder of the Sugar Gamers. Renowned game designer, Erika Chappell from Newstand Press, also contributed an incredibly moving story. Erika has produced a wide range of amazing tabletop RPGs, from gritty, emotional roleplay inspired by Platoon in Patrol to her soon to be released anime Magical Girl game called Five Across the Heart. We also obtained the work of Darcy Ross, who recently joined the Monty Cook Games crew and is a Cypher System powerhouse. Darcy’s experience with weird biology lead her to create a very evocative story about “de-extinction, fashion, and resistance” in a flooded archology floating in the middle of the Pacific Ocean. The collection also contains the work of exciting new faces on the gaming scene, such as Chicago local tech expert and aspiring Youtuber and Podcaster, Lonald Howard (podcast he makes with his wife here). Online personality, globe trekker, and first playtester to grab Axon Punk and really run with it, Mika Talley wrote us a wonderful story drawing from her experience theorizing about AI. Artist, podcaster, and longtime Axon Punk playtester, Elvery Tren Peters wrote his story to help develop the historical timeline of the Axon Punk world and the global cyberwars that have ravaged the planet. Artist, video game designer, and fanfiction author, bakayaro onna is positively thrilled to release their first official work of published fiction, which focuses on a cyber music/dance club and it’s disembodied Chief of Security and Surveillance. Finally, longtime friend of the game, cosplayer, queen of literature, and real-life Magical Girl, Emily Reinhart wrote a high-octane adventure that will keep you on the edge of your seat until the very end. If you would like to read these awesome stories and play Axon Punk, the best way is to get the brand new physical gamebook and PDF bundle, now offered through Indie Press Revolution. 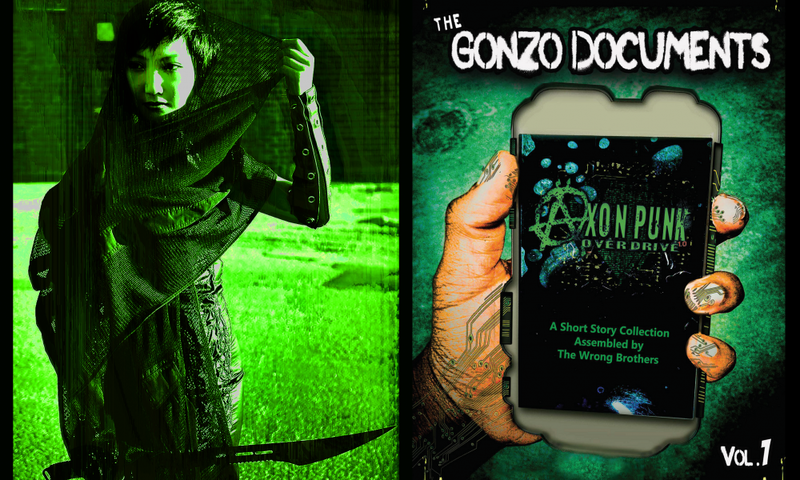 This bundle includes a physical copy and pdf of the Axon Punk gamebook, a pdf of The Gonzo Documents story collection, a pdf of the Quickstart rules for the game to get you started right away, character sheets, and printable rules cheat sheets for you to reference during play. The game also contains rules to make your own, organic community in the megacities, so you too can have your voice expressed in the cyberpunk future. Get your copy of the collection today! Click here for link to Print + PDF Bundle!